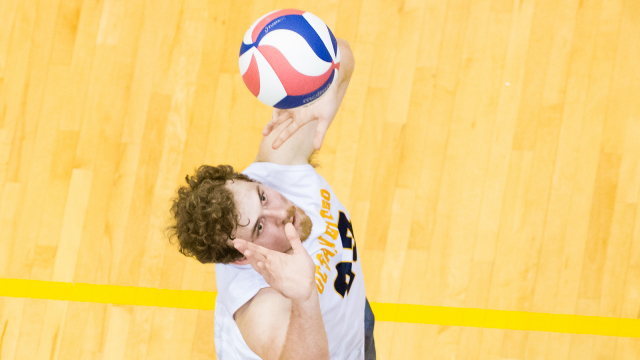 The UC San Diego men’s volleyball team took on the UC Irvine Anteaters at home for their Big West season opener, ultimately losing the match 3–1. This was a tough matchup for the Tritons. Before the game, UCI was the clear favorite: the third-ranked Anteaters came into Friday’s game with an 11–2 overall record and a five-game win streak. In what has become somewhat routine for the Tritons at RIMAC Arena, the home team took the first set against the favored UCI, 25–23. Though the Anteaters were able to climb to an early lead, the Tritons contested every point and fought to retake the lead. The set had 8 ties and 3 lead changes. Despite UCSD’s promising start to the match, the Tritons dropped the next three sets to lose the match. After the initial set, the Anteaters were able to regain their footing, beating the Tritons 25–19, 25–18, and 25–21 over the next three sets, respectively. UCI handled UCSD in commanding fashion, not allowing the Tritons to take a single lead after the first set. With this game in the books, UCI advances to 12–2 overall; UCSD falls to 5–7 record. Coming off two wins against Concordia University Irvine and UC Santa Cruz last week, UCSD came back down to earth against the NCAA powerhouse. UCI showed themselves to be the superior team. UCSD committed 24 errors compared to UCI’s 4. In last week’s game against CUI, the Tritons were able to limit their errors and emerge out of a close game with a win. Points from kills were about even between the teams as UCI finished with 56 and UCSD with 54. UCSD’s errors helped UCI along to their 12th win and highlighted the stark difference in ability between these two teams. Next week, the Tritons face off with the Anteaters again on Feb. 14, but this time the game will be at Irvine. The Valentine’s Day matchup will be another challenge for the Tritons. UCI is undefeated at home, now on a seven-game win streak and of course, took down UCSD in their most recent matchup. If the Tritons could manage to pull off a win, it will be a true upset. The game will start at 7 p.m. at the Bren Events Center.